this time i blended black and green alcohol inks, then i drew the design with a silver gelly roll glitter pen...which turned sort of gold and copper as it dried. i curled the wire into the number holes in the back to grip it so i can wear it as a pendant. the wire squiggles along the bottom. i really like this one! i love me some lutradur!! it was confirmed at work today...we're coming out with 10-sheet packs of 8.5"x11" lutradur® in april!! i'm so excited!! usually you have to buy it in yards off the bolt. but now these sheets are perfect for lots of smaller scale arts and crafts applications, plus you can run them through your inkjet printer. here is a super cool book about what it is and how to work with it. this is just the greatest surface ever...it's a spun polyester that is kinda like paper, kinda like fabric. it's tear-resistant, fibrous and somewhat transparent. i've painted and stamped on it and tonight i made an atc with it. first i stitched a painted piece of lutradur on to a piece of timtex stiff interfacing, then i used my bejeweler tool to heatset some swarovski crystals, and then i used just the top of the tool to burn in some little circles. i snipped the ends of the zigzag stitches at the bottom just for fun (i added a drop of glue at each point on the backside so the stitches won't come loose). i added my name with mini-scrabble tiles and voila! yay! i got my full set of alpha inchies from the swap i did - look how cute they are! i had the letter "g" - i used my new cricut machine to make them, it was fun layering gold foil paper in with the cardstock. now i have to decide what to do with these....i think i want to make something that uses all of them together, rather than trying to use them separately for monograms or words. so i had signed up for an animal-themed atc swap with 20 of the fiskateers, thinking i just had to make one atc, and i'd get another atc back. so i mailed my card off to the hostess, Amy...only to find out after she got it that i was supposed to make 20 atcs...we will each get one from every participant in the swap. ay carumba!! so i had to move fast to make a new batch and get them ready to mail out tomorrow. i opted for a different image and design that could be more easily "mass produced." i found the sloth image in a yahoo search last year, but could not trace it to a photographer to credit. i turned it sepia and cropped it, added an eyelet, ribbon, stamp and writing. now that i know i'll be getting 19 atc's back, i'm excited - what a boon to my collection! i want to devote this issue to the amazing work on some of my favorite challenge blogs for papercrafts and mixed media. i can't say enough good things about challenge blogs...they are so inspiring and motivating! when you want to create something but you just need that little push, these blogs are right there ready to give you a theme, some samples, and a deadline...not to mention built-in support for your efforts from all the other participants. when you visit the blogs below, take some time to click on the comments to the challenge posts where people leave links to their work...it's like walking through a virtual art show! 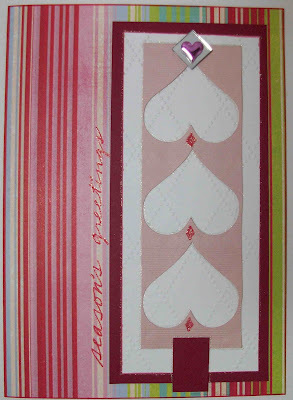 • pretty paper hearts...so many sweethearts here! • inspire me thursday...these comments are so worth your time! • theme thursday...love the game pieces theme! there are so many more! check out my challenge blog roll down further on the right. above is my submission for this week's challenge of "my choice" at saturday surprise....since i've been playing a lot of online scrabble lately, i made a tag to celebrate my favorite 2-letter word that is always worth lots of points - xi - the 14th letter of the greek alphabet. hope you join in some of these challenges - let your creative sparks fly! it's the 20th! using random.org, i drew emma's name as the winner of this sweet colorful thank-you card. emma is a crafter and blogger in the uk....although she has not posted to her blog in a couple months, so i do hope she is still enjoying something creative. congrats to her! thanks to everyone for following my blog...i hope you find that little extra bit of creative mojo here. today i snapped a picture of this gorgeous tree outside my office that always blooms early. it's a mess later when the blooms drop and we all track little white petals all throughout the building, but right now in the morning light or by sunset light, it is just beautiful. i came home and painted it with my new artrage program and bamboo tablet - the effects are wonderful, it feels and acts like real painting. i used three different "mediums" - pastels, glitter, and airbrushing. i opted to make it greener with less sky peeking through. these are a few things i've made for my mom that i hope to make more of someday...sigh...so many crafts, so little time! btw...have you been to my new website yet? lots of cute cards for sale!!! i'm not much of a 12x12 album scrapper - i tend to do smaller collections of photos in board books. but there is a 12x12 board book now, so i thought i'd do a few special 12x12 pages as i sift through and organize a few boxes of old photos. so here is a layout that commemorates my senior year of high school....i had fun playing with my cricut die-cuts and some epoxy stickers that each have special symbolism. during all the blog-hopping for the owoh give-away, i received an "i love your art blog" award from the funky fairy shop in idaho. she said she has been wanting to do some papercrafting and she found some inspiration on my blog. i'm really happy to be able to connect and share with so many people over the internet! this award is such a sweet gesture....so now i'd like to pay the gesture forward to two of the artistic bloggers who inspire me the most! btw - near as i can trace, the art for this award badge was designed by atomic velvet sigh. everyone needs birthday cards handy, so come on over to scrappy hours and show us what you've got! here is the card i designed - i just love blue and brown together, and a little bright green really makes it pop. this flocked floral paper is really textural and fun. this afternoon at work, we had some craft time in the conference room to make valentines...here's one that i made with crinkled film, epoxy stickers, ribbon, ric-rac, and a sakura glaze pen to highlight the rubberstamping at the bottom. now who shall i give this to? so i decided to join an atc swap with the fiskateers. i also was invited to join a local atc group by my very talented friend daniela. so here's my first stab at it...the fiskateer swap is an animal theme. i love my dragonfly punch, so i went with it, kept it simple. my next try will be edgier. it's harder than i thought it would be to design something interesting in such a small space! fyi for those who might not know...atc stands for "artist trading card." they are 2.5"x3.5" and artists make 'em, trade 'em, collect 'em. my collection officially began with the atc lorraine sent along with a gorgeous little art purse and necklace she made me! winners for one world, one heart give-away! yippee! i used random.org to get 3 random numbers between 1 and 338...the number of comments left on my owoh post. thanks to everyone who visited my blog and put your name in the hat! • tania from south dakota! this blog caravan was lots of fun, i still haven't been able to see all 900+ blogs who participated, but i'll get around to all of them eventually - so far it's a great list of talented artists, crafters and writers. the board book here is one i did a few years ago for my bachelorette party - that was such a good time! i really like how this book cover resembles the one world, one heart logo, too. almost 300 entries for my one world, one heart giveaway! it will take me some time to visit everyone who has commented, but i will! thanks so much to everyone who is participating in owoh - it's such a fantastic way to bring people together. we all live under the same sky! i took this picture from my front yard the other day. just for ducks, i thought i'd open with a panoramic shot of downtown san francisco that i took from the car as we were driving through. i used to live in the city, i miss it sometimes. so here we go with another batch of links featuring some fab papercrafts! 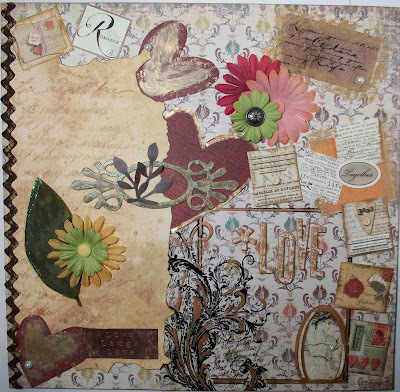 • i love patty's site - lisa's altered art - with so many delightful vintage images....and her daughter shares my name! • look at these adorable matchbooks with little tags inside from eleanor at the crafty blog. • I just love the idea of creating paper pennants - see what clairabelle made - and her matchbox bottlecap doll is great too. • jackie at crafting a green world shows us a cute design for a scrappy family tree. • sue made a lovely card using a faux batik technique - can't wait to try it myself! 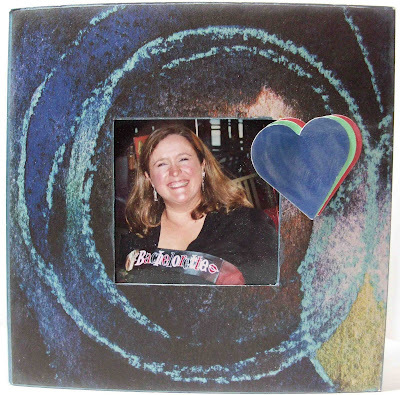 • jane shares a tutorial on using embossing paste to make a textured image with stencils. • sue at jabberwocky made a gorgeous card featuring the art and style of gustav klimt. • kathy did such a great job of blending many different patterned papers to make a really beautiful card - she says it's not her best work, but I sure like it! well, i could go on and on all night...this issue was a really fun romp for me! i hope you are as inspired as i am by all this wonderful talent. i did 2 other small pieces on lutradur, using acrylic inks and a little acrylic paint, they are about 6"x8". i love how the texture of the lutradur shows through, and i also love how the ink bleeds along the fibers. lutradur is a spun polyester that feels sort of like fabric, but acts more like paper. it used to be a roofing material, but now it is sold as interfacing. 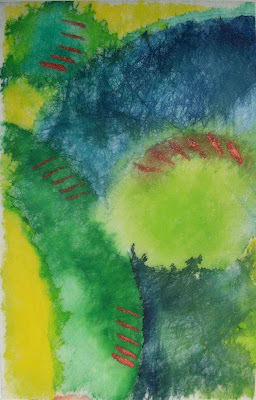 author and artist lesley riley calls it "the magic in between." this one is called "disks." you can see my other piece on my flickr page! it's the 5th of the month - time to announce the winner of my blog follower drawing! and this time it is jan rogers - congrats! jan hosts a group on papercraft planet - good times on that site, check it out! this card is extra special, because i designed it for part of a how-to video that we shot at work for a new product - can't tell you the details yet, but it will be out later this spring! my co-worker kerry lent her lovely hands to the shoot and she assembled the card as part of the video. i added a couple more flowers and a touch of the glitter pen later to finish it off. thanks so much to everyone who visits and comments - i hope i have something here that inspires you to create! thought i would share my first test drawings with these wonderful inktense watercolor pencils, which i was honored to demonstrate in the manufacturer's booth at the craft and hobby trade show. 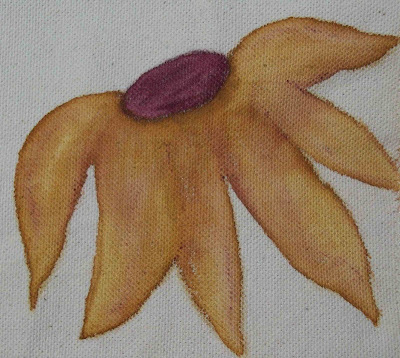 i drew a sunflower on blank canvas books with lighter strokes and more color blending, and then i stenciled a little scrolly flower with harder lines on lutradur. you get the best of watercolor effects and the control of a pencil - they are my new favorite thing! i can't wait to play with these pencils more, i received a gorgeous set of 24 from col art to prepare for my demos - it was a great show! 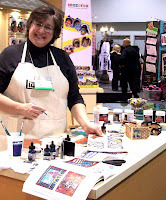 i also demo'd liquitex inks and acrylic paints, which i am also head-over-heels in love with! i posted more details about the cha show here on our blog at work! 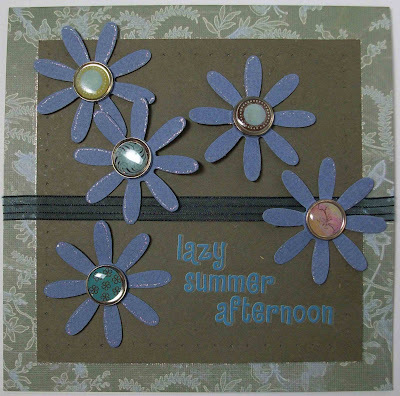 my inspiration card is posted on the scrappy hours blog. the challenge is to create something with hearts and silver as a tribute to the tin man from the wizard of oz. 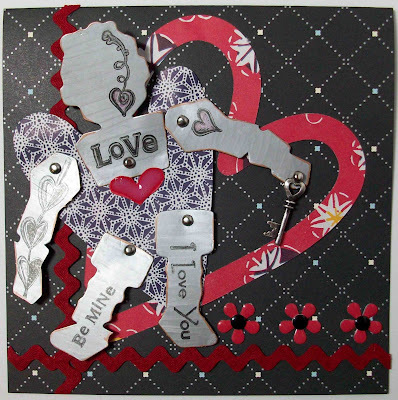 i went the whole nine yards and made a little tin man valentine! the cardstock is silver on the inside too. the papers for his body and the large red accent heart are japanese, and he's holding a little key to his heart...he even has a little "rust" around the edges! join in the fun at scrappy hours! 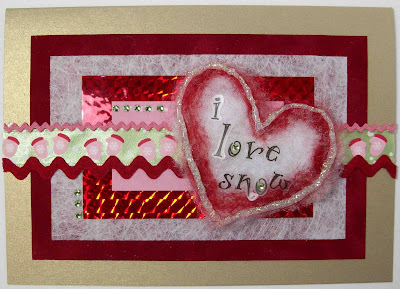 my inspiration card is posted at the ccayr blog - i did two cards for this challenge of using red, pink, white and hearts in a christmas card. for the one above, i die-cut hearts on my cricut and used the negative space to turn upside down into a tree. i handwrote the sentiment and added some accent with my glitter pen. for this card below, i layered several specialty papers - starting with a dull metallic gold cardstock, then red velvet, then white interfacing, then red foil hologram, then pink velvet. i used some yummy vintage ric-rac that my mom found in a second-hand store (i saved its original packaging - 3 yards was only 15 cents back in the day!) i needlefelted a snowy heart and trimmed it with glitter glue. join in the fun at christmas cards all year 'round! i'm excited about participating in the third annual one world, one heart give-away! it runs from january 19th to february 12th. over 900 bloggers all around the world are joining in - to find new blogs, meet new people, and win fun prizes. "the give-away portion is like hosting an open house...as if we were all living in this gigantic neighborhood where once a year we visit each other's homes to meet and get to know one another. at each home there are goodies that you have a chance to win like a door prize. you leave your name and then each home chooses a winner...and now you have met a new "neighbor" and you've seen where they live, and you have something that someone lovingly chose to give!" •••••if you want a chance to win my give-away, just leave a comment here! i will be sending out three ready-to-go! blank board books, along with some assorted papers, markers and embellishments - winners will be selected at random on february 12th! visit the blank board book gallery on flickr for great ideas! click here for more info on the heart board book i made above.